Saturday April 20 rain date is on! 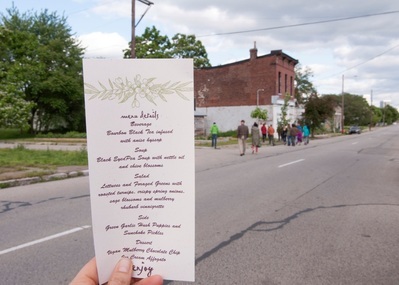 We strolled and enjoyed food & beverages grown and crafted right here in the Portland neighborhood! Lots of Food thanks our neighbors at McQuixote's, The Table, Against the Grain, Shuckman's cheese, and Amore di Mona for helping create a delicious vegetarian meal and a one-of-a kind neighborhood experience! 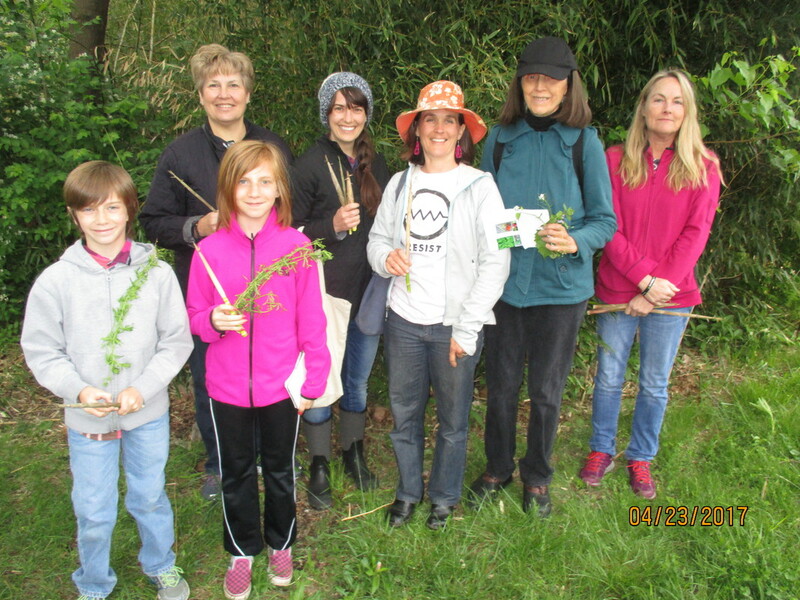 Thank you Mary Beth Brown, Aura Vaught, and Carolyn Waters for Foraging workshop photos! Spring Open House March 22, 2014. Thank you to all our friends and neighbors who came by to visit and help plant 13 of our 26 almond and hazelnut trees! Our Kickstarter Campaign was a success! Thank you for helping us get this project off the ground. The Kickstarter campaign paid for the chain link fence and the rainwater irrigation system. Feb 12, 2013: Louisville Metro Council's Vacant Property Committee hosts a public meeting soliciting ideas for what to do with Louisville's vacant lots. Amanda and Peter prepare and present a proposal for growing food on vacant lots that we call "Lots of Food"
March 4, 2013: After examining the list of Land Bank properties Peter and Amanda submit an offer to purchase 5 parcels from the Land Bank, for $10 per parcel. March 2013: We get assistance from our local USDA-NRCS agent in evaluating the soil on the site and we send samples off through our Jefferson County Cooperative Extension Office to test for nutrients and lead. They come back pretty clean- good for the things we want to grow. The soil is a bit compacted but it's rich sandy loam - it just needs a little TLC and compost tea! April 2013: We order trees and plant them in temporary locations. Hopefully they will be one year closer to maturity after we move them to our lot. We meet some neighbors and tell them we're hoping to turn the Lots into a garden and orchard. Everyone we talk to seems to support the idea. May 23, 2013: The Land Bank Authority meeting is scheduled for 2pm. Amanda presents the Lots of Food proposal to an approving audience. There is no quorum and no decisions can be made. We go to the lots and pick delicious mulberries off the trees. June 2013: We find old records for the properties in the Deed Room in Metro Hall, dating back to the mid-1800's. We find maps at the University of Louisville Archives showing that there used to be a tamale factory on the same block (!) The historian at the Portland Museum recalls that families in that neighborhood used to all have backyard gardens. July 25, 2013: Peter attends the Land Bank meeting at 2pm and presents our proposal again. No decision is made. We continue to work on our business plan, with some valuable assistance from KCARD (Kentucky Center for Agriculture and Rural Development). August 22, 2013: We're APPROVED! The Land Bank approved our request for our 1/3 acre. Time to get to work!! October 7, 2013: We close the deal. Our new LLC, Lots of Food, has title to the property. Now we own it and we're starting to plant trees! November 2013: With generous help from friends from Jefferson National we dig more than 20 holes for trees, trim unruly trees, and start hauling compost to the Lots. December 2013: We launch our Kickstarter campaign to pay for fencing & water catchment. We file papers with the Louisville Metro Revenue Commission since we are new business owners! A few warm days get us out hauling compost, cleaning up, measuring for water catchment tanks and fencing. Time to order seeds for vegetables! February 6, 2013: Our Kickstarter campaign closes and we are funded! Thank you! February 7, 2014: Lots of Food submits the first Market Garden permit application to Louisville Metro. See our You Can Do It page for details. February 2014: We join the Urban Growers Cooperative, organized by Louisville Grows, and agree to grow certain vegetables for distribution especially in West Louisville! Hooray for growing fresh food close to home. March 23: Open House ! About 30 friends and neighbors join us and we plant 13 almond and hazelnut trees, bringing our total to 26. April 2014: We are building beds, and planting carrots, beets, potatoes, swiss chard, parsnips, and green onions for sale. We've also got blackberries, black currants, chamomile, and other herbs for wonderful herbal tea. Spring brings snakes! woodpeckers! and other wild companions who enjoy the mulberry trees and the greenery as much as we do. 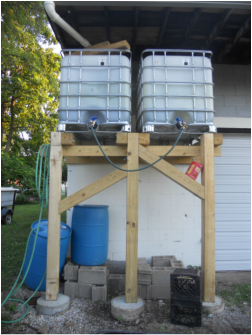 June 2014: Beds are dug and planted with vegetables, and our water tanks are catching rainwater! Summer Open House and Summer Foraging workshop June 22. 2015: Some nut trees have nuts on them; Produce is going to the Urban Growers Co-op, where it is being distributed to local markets, Fresh Stops, and restaurants.